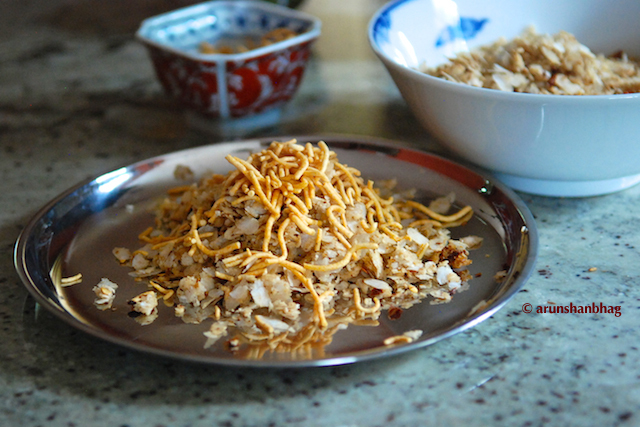 Phovu (beaten or flattened rice) freshly mixed with few spices is a staple breakfast of Konkanis. We grew up eating tambdo phovu nearly every day (tambdo for red comes from the crushed red chillis in this recipe). When visitors arrive unannounced, aunts or grandma would quickly mix this snack, usually takes less than 5 minutes to prepare. Since this is simply mixed, it is also called kāláyilo (mixed) phovu. 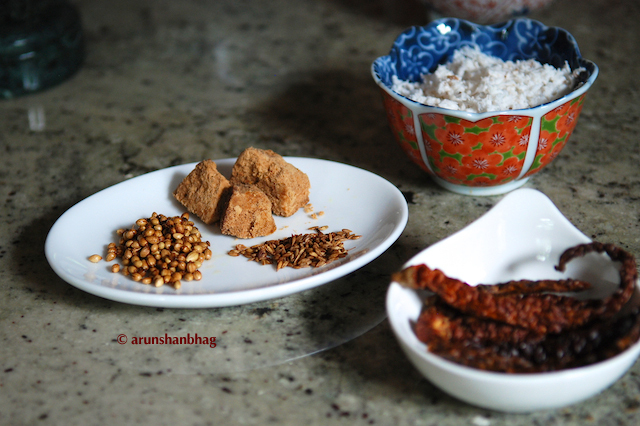 Many households use phova piTTo (powdered spice mix for phovu), but we made this from scratch. Roast the coriander and cumin seeds; then the red chilli peppers separately in a wee bit of oil. Crush the coriander and cumin first in a mortar-pestle, add roasted chillis, then jaggery and salt, then the grated coconut. Previously I have crushed this in a steel bowl, but now I use a mortar pestle; works well. Mix in phovu in small amounts with your hand. It helps to crush and ‘break’ the phovu. Moisture from the grated coconut helps to soften the phovu, but you can sprinkle a teaspoon of water. Serve immediately; spread sev as needed. Hello Arun, I had given my son a pkt of phova kalle masalo along with other instant masalas etc.first time staying away from the fly sharing a company provided flat wiht another colleague. Both newbies to cooking, eventhough there is a working kitchen they are reluctant to try. I am just encouraging them online 🙂 to try simple recipes. This is a nice pitctorial recipe i am sure he can follow easily. .
and yes, once he gets over the initial hesitation, this is such a wonderful meal. Looks delicious! We make something similar with a little different spicing and add boiled potatoes to it. We have another version which has turmeric (looks yellow) and we use potatoes. Possibly the same. I already have taken pics of that dish, but will have to get it in rotation in a month. Our fore-mothers were were sooo creative with their dishes. Tambdo phove, chaNe upkari is one of my fav combinations.. Looks delicious..
OK, will have to pester M to make chaNe upkari. Yum, Yumm! haven’t had that in ages. Thx, Hope you are doing well. tambdo phovu with godda capi (coffee)…wow what a combination! Oooo! In kumta folks are partial to “kasay.” and interestingly, you can order it in a restaurant! Imagine that.